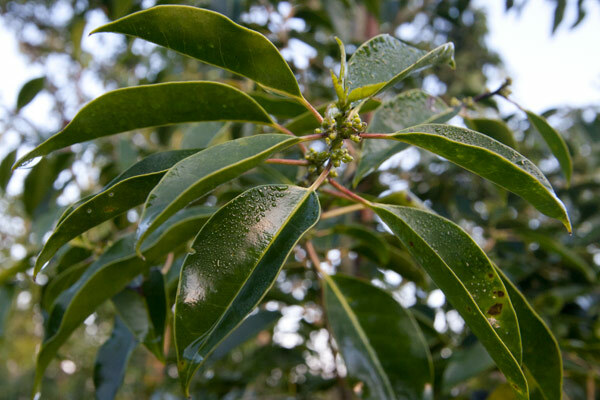 Ilex krugiana (Krug’s Holly, Tawnberry Holly) prefers full sun or partial shade; average height is around 20’- 25’ with a dense, rounded canopy. It is a beautiful native ornamental plant that in the past has been underused, but as of recently has gained popularity in the landscape, because it is trouble- free and drought tolerant. 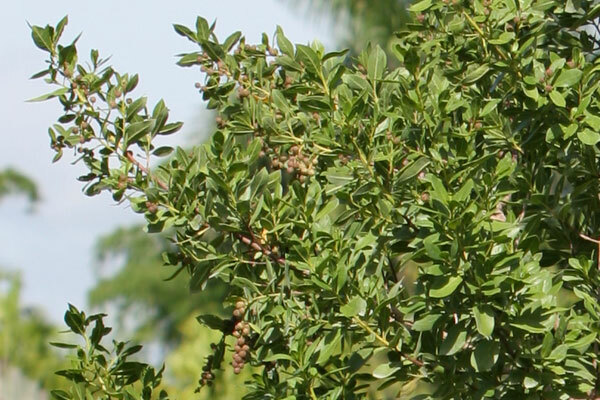 Female trees produce bird-attracting red fruit that turn black when ripe. 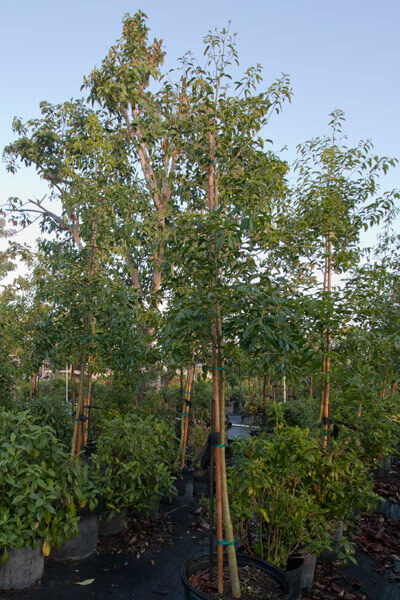 Guapira discolor (Blolly) prefers full sun or partial shade; the average height is 15’-20’. 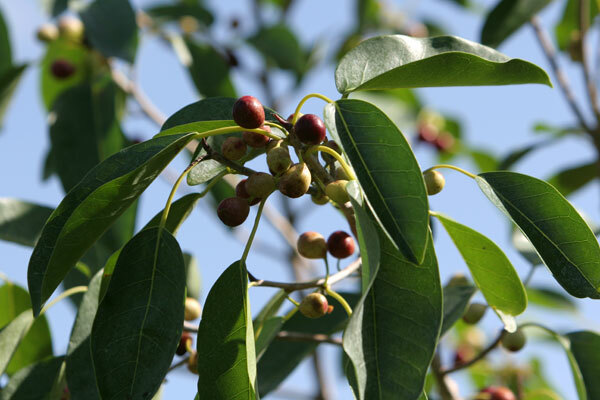 Blolly is salt- and drought-tolerant, and the female trees produce reddish-pink fruits that are savored by the birds. Blolly is another great native plant that is still underused in the landscape. Krugiodendron ferreum (Black Ironwood) prefers full sun or partial shade; found growing in the understory of hardwood hammocks. Black Ironwood ranges from Brevard County south along the coast into the Florida Keys. It is slow growing, but very attractive in the landscape. The wood of the Black Ironwood is extremely dense and will sink in water. The new foliage appears reddish and small green, star-shaped flowers appear in November. The small fruit are eaten by birds. Chrysophyllum oliviforme (Satinleaf) prefers full sun or partial shade and can reach 25’ in height. 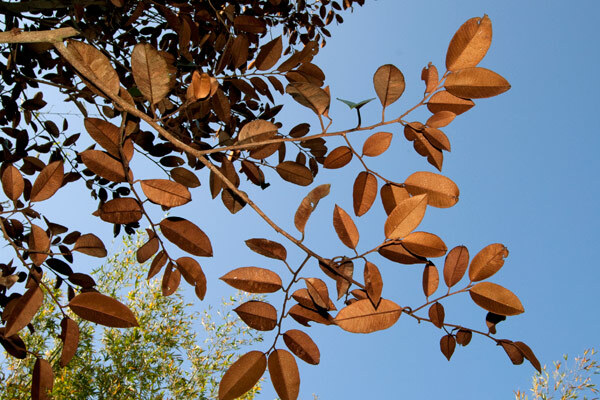 Satinleaf is a rare, endangered tree found in southern Florida’s hardwood hammocks and is spectacular in the landscape because of the leaves that are dark green above, coppery below. It blends in nicely with other native plants and is a superb tree to attract migratory songbirds, such as warblers, vireos and flycatchers. 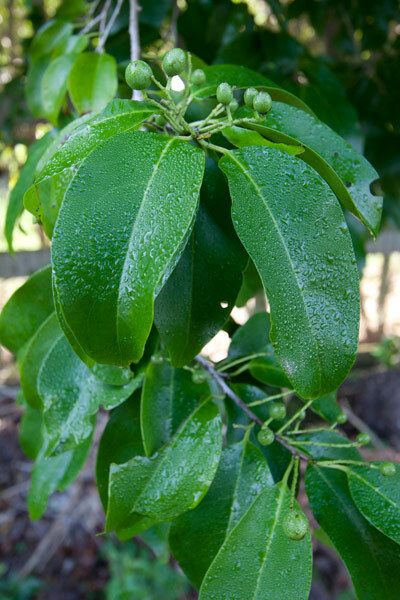 Prunus myrtifolia (West Indian Cherry) prefers full sun or partial shade, and typically reaches about 20’ in height at maturity. The leaves are very glossy making West Indian Cherry a great specimen tree. It is a rare endangered tree that is found in the hardwood hammocks of Miami-Dade County in Florida. The fruit attracts birds and other wildlife. 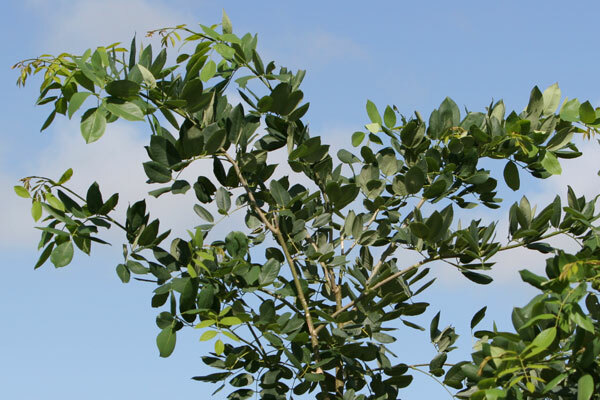 Simarouba glauca (Paradise Tree) prefers full sun. It is a large hammock tree that may reach 30’ or more in height. 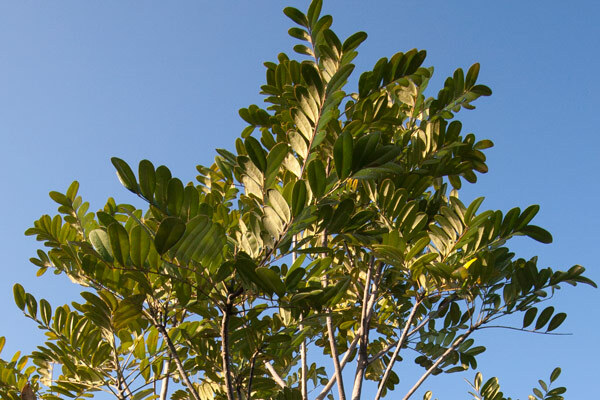 The glossy pinnately-compound leaves tend to be clustered near the branch tips and the reddish new growth makes Paradise tree a great specimen. It can tolerate drought once established but is somewhat cold sensitive. The tree is dioecious, meaning male and female flowers are on separate trees. 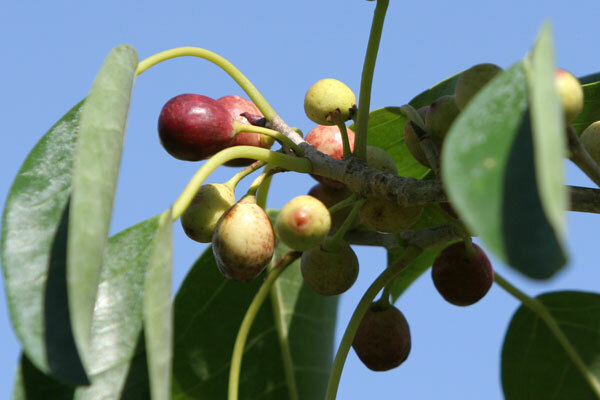 Female trees produce 1” fruits that turn dark purple when ripe and are edible, but astringent. The fruits can stain driveways, cars, and patios so plant female trees away from those areas. 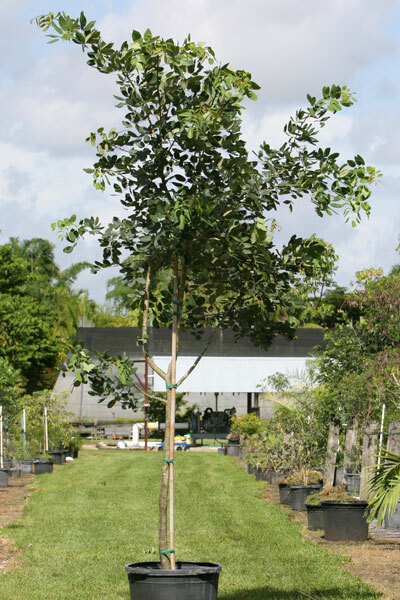 If you have the space in your yard, Paradise tree is a great addition to the landscape. 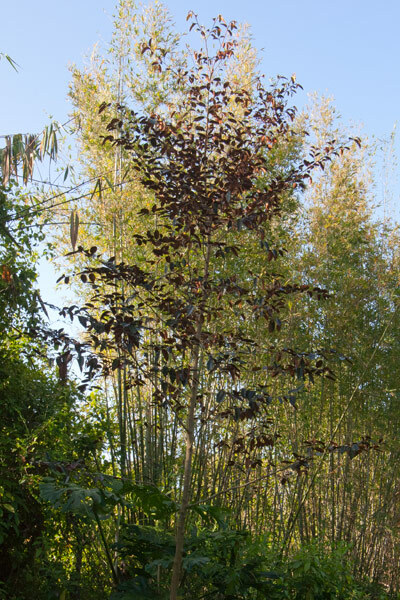 Piscidia piscipula (Jamaica Dogwood) performs best in full sun and is fast-growing. 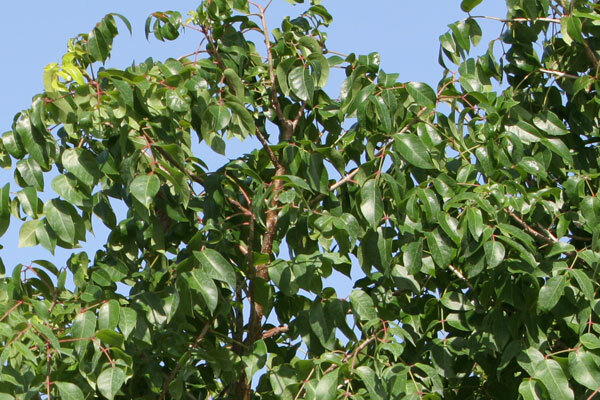 It is a hardwood tree that can tolerate salt spray, long periods of drought, and damp soils. The fragrant flowers appear in late spring and range from white, lavender and green, literally covering the branches when the tree is leafless. The leaves, twigs and bark can stun fish making it easier to catch them, but this practice is now illegal in Florida. Drive down to the Florida Keys in late spring and you can see Jamaica Dogwood trees flowering along the edges of hammocks. Lysiloma latisiliquum (Wild Tamarind) is a spreading tree that can reach heights of 40’ or more. It is very fast growing, drought tolerant, withstands strong winds and has no major pest problems. The leaflets are very fine, almost fernlike and the new foliage appears reddish. The tree drops its leaves in late winter in response to drought, but quickly re-leafs in early spring. The leaves serve as a larval food for the mimosa yellow, large orange sulfur, and the cassius blue butterflies, and also attract gnatcatchers, warblers, vireos and flycatchers during fall and spring migrations. The endangered linguus tree snail is often found on the trunks of Wild Tamarind trees in hammocks of southern Florida. 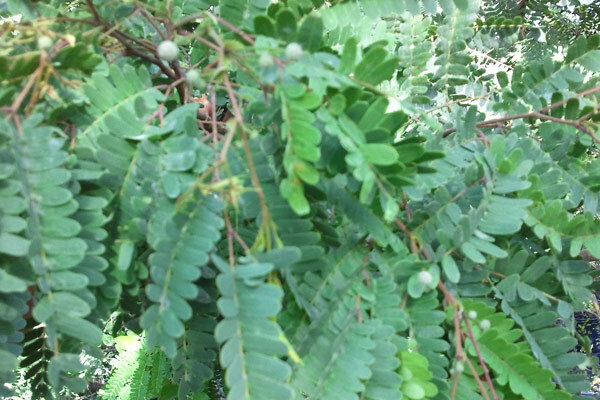 Wild Tamarind is a great tree for schools, parks and yards if you have the space for a large spreading tree. 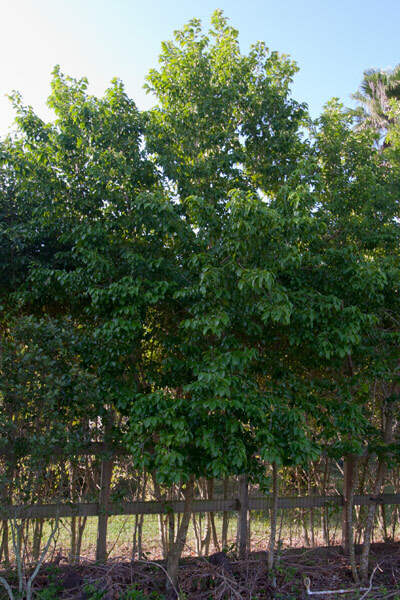 Ficus citrifolia (Short-leaf fig) prefers full sun and is fast growing. It is a large canopy tree that can reach 40’ or more in height and found mainly in hammock areas in Miami –Dade and Monroe counties. 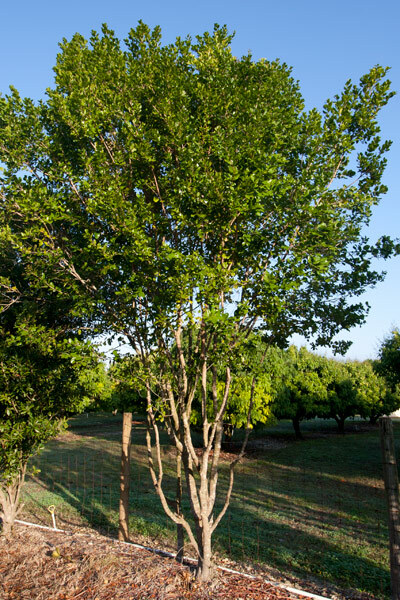 Once established Short leaf fig is drought tolerant and will grow in nutrient poor soils. The flowers are pollinated by a single species of fig-wasp; the fruits are small edible figs that turn purple when ripe. It is the larval host for the Ruddy Daggerwing butterfly and the Cedar Waxwing and White-Crowned pigeons are a few of the many birds that eat the fruit. It is a great specimen tree for schools, parks, street plantings and those who have the space for a large tree. 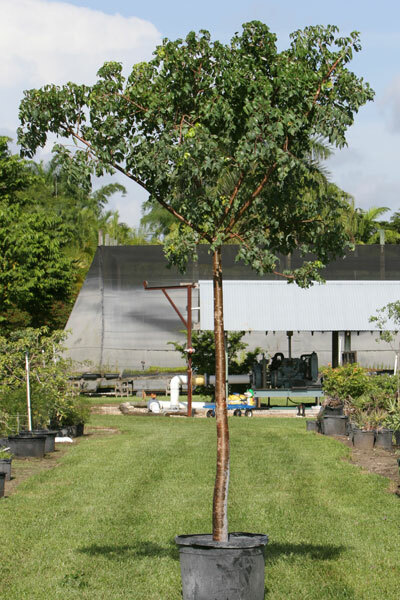 Bursera simaruba (Gumbo-Limbo, Tourist Tree) is a fast-growing canopy tree that will provide a lot of shade. It will reach over 40’ in the height and can grow as wide as it does tall. 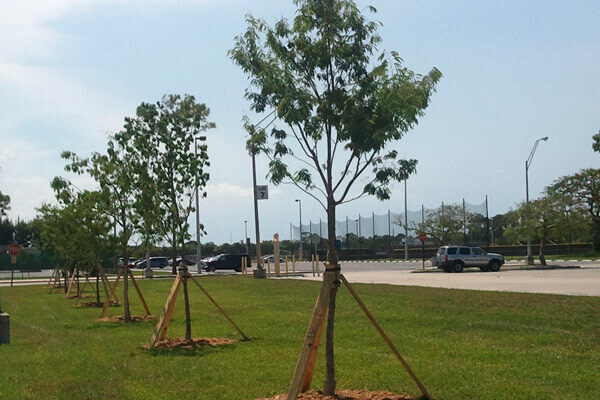 Gumbo-limbo can withstand strong winds (maybe lose some branches, but unlikely to uproot) is drought- and salt-tolerant. The peeling reddish-bronze bark has given this tree its comical name “Tourist Tree” because it resembles a sunburned tourist. 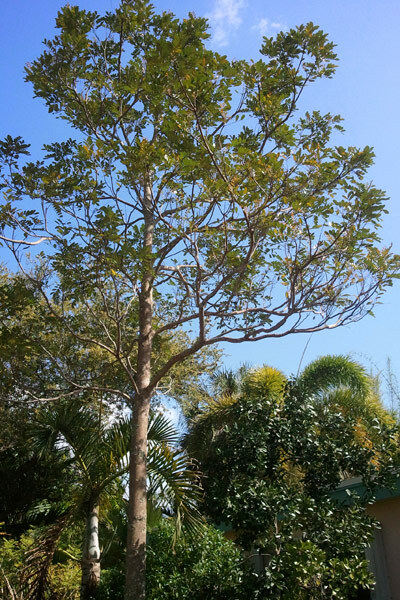 It ranges in Florida from Cape Canaveral south to the Florida Keys and is extremely popular in the landscape as a specimen, street and accent tree. It can be grown from cuttings but is a much more superior tree if grown from seed. Flycatchers, kingbirds, vireos and mockingbirds are among the birds that eat the fruit. It is also the larval host for the endangered Dingy Purplewing butterfly. Conocarpus erectus (Green Buttonwood) prefers full sun to partial shade is somewhat slow-growing. It will reach over 30’ in height and can either be pruned as a shrub or grown as a tree. 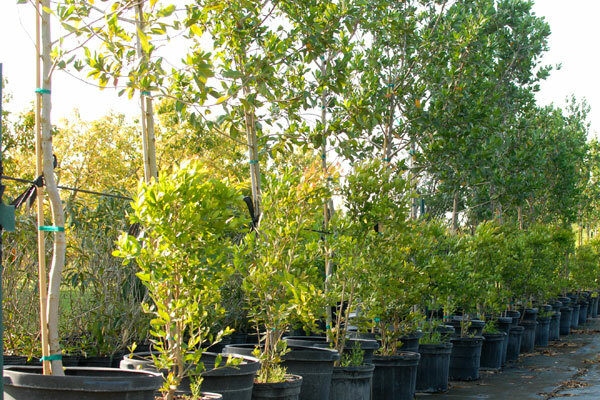 Green Buttonwood is extremely salt tolerant, can handle strong winds and even wet-dry conditions, growing just upland from mangroves. It is more problem free and more cold tolerant than the silver-leaved form. Green Buttonwood has dark, fissured bark which makes it a great tree to attach bromeliads and orchids.